The Russian Ministry of Defense is holding a press conference, during which new details will be revealed about the Malaysian Airlines Boeing 777 that crashed in eastern Ukraine in 2014. Four years ago, on July 17, 2014, a Malaysia Airlines Boeing 777 flying from Amsterdam to Kuala Lumpur crashed near the city of Donetsk. All 298 passengers and crew on board the aircraft died. Kiev accused local militias of downing the aircraft, while they said that had no weapons capable of downing such a plane. "The Prosecutor General's Office of the Russian Federation has examined the materials received from Russia's Investigative Committee related to a request for legal assistance from the National Prosecutor's Office of the Kingdom of the Netherlands in connection with the investigation of the crash of the Malaysian flight MH17. It was handed over today to a representative of the Dutch side," Russian Prosecutor General's Office spokesman Alexander Kurennoy announced. "The JIT has taken note of the information that has been publicly presented by the authorities of the Russian Federation for the first time today ... The JIT will meticulously study the materials presented today as soon as the Russian Federation makes the relevant documents available to the JIT as requested in May 2018 and required by UNSC resolution 2166," the statement of the Joint Investigation Team read. "We would like to say that the claims of the involvement of the Buk missile system, which belongs to an air defense regiment of the Russian Armed Forces, in downing the Boeing have not been confirmed," Russian Investigative Committee's spokeswoman Svetlana Petrenko said. "I believe that we should move beyond the Defense Ministry's statement, the issue should be raised at the UN level," Frants Klintsevich, a member of the Defense Committee of the upper house of Russian parliament, told Sputnik. "The images of a tractor, a trailer, and a Buk were built into the image of the corresponding section of the motor road during the production of this video... Many signs of falsification of the video recording were also revealed in an episode showing the movement of the Buk in Lugansk," Russian military reported. "On May 24, 2018, a briefing was held by representatives of the Joint Investigation Team, during which fragments of the engine and nozzle of the missile of the Buk missile system were demonstrated. 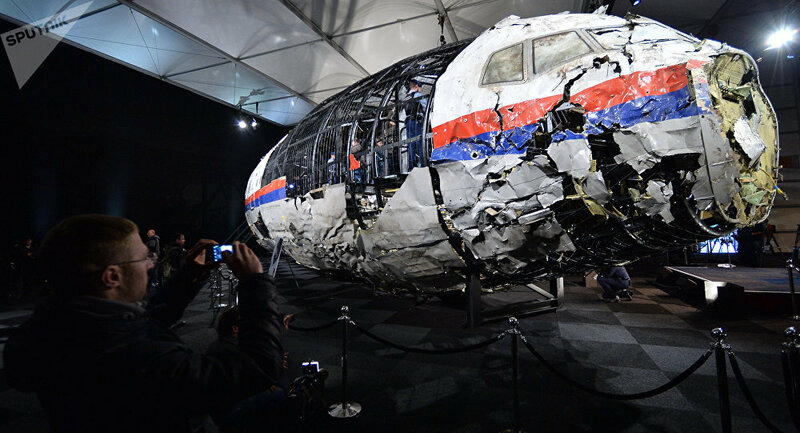 According to the investigators, the Malaysian MH17 Boeing was downed on July 17, 2014. At the same time, attention was drawn to the numbers of these components of the 9M38 missile, which you can see on the slide," Lt. Gen. Nikolai Parshin said. "We have an audio recording of telephone conversations of Ukrainian servicemen made in 2016. 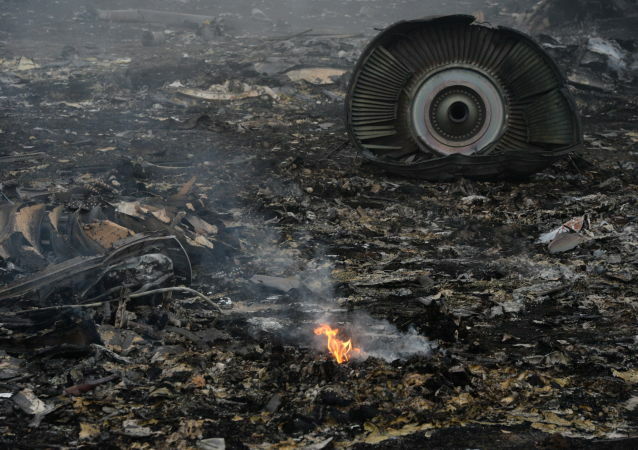 An analysis of its content confirms earlier made conclusions about the direct involvement of the Ukrainian side in the crash of the Malaysian Boeing," Konashenkov said. He said the voice on the audio recording belongs to Ukrainian Armed Forces Col. Ruslan Grinchak. The Russian Defense Ministry warned that Ukraine could destroy documentation for the missile that shot down flight MH17 in order to conceal the truth. "So the missile ... on December 29, 1986, was sent by rail to the military unit 20152. It is well known that the missile was received by the military unit," Parshin said at a briefing. The Russian Ministry of Defense also stated that the Buk missile that the regiment armed with the missile that knocked down the MH17 flight was repeatedly involved in the so-called anti-terrorist operation in Donetsk and Lugansk. "Separately, I will stop on the military unit 20152, where the missile with the number 886847349 was put, its real name is 221 anti-aircraft missile brigade ... By the decree of the president of Ukraine this unit was renamed into 223 anti-aircraft missile regiment. Currently, this unit is located in the city of Stryi of the Lviv region, they still have the Buk systems. It is noteworthy, that units of the 223 regiment, since 2014, have repeatedly been involved in the so-called anti-terror operation in Donetsk and Lugansk regions," Lt. Gen. Parshin said. The Russian Ministry of Defense reported Monday that the documentation for the Buk missile is still stored at the Dolgoprudny plant, where it was built. The ministry also announced that the Joint International Investigation Team can examine declassified documents on the missile, as Russia had sent the new data on the issue to the Netherlands. "This is a set of technical documentation that is filled at the manufacturing plant for each manufactured product and stored there, regardless of whether it is in Russia or abroad. Among the documents presented to you is a passport for the nozzle cluster 9D13105000 No. 8-30-113," Lt. Gen. Nikolai Parshin, the head of the Main Missile and Artillery Directorate told a media briefing. The Defense Ministry also showed the document for the engine of the missile 9D131 with the serial number 8869032. "As can be seen on the slide, the numbers of components of the 9M38 missile and the number of units noted in the technical documentation stored at the Dolgoprudny Research and Production Enterprise and those presented at the briefing today, are identical," Parshin said. "The Joint Investigation Team presented video materials to prove that a self-propelled firing system of the Russian 53rd anti-aircraft missile brigade was allegedly present and involved in the tragedy of the Malaysian Boeing on the territory of the Donetsk and Lugansk regions. Russian experts with high qualifications conducted a study of these videos and concluded that they were falsified," Russian Defense Ministry spokesman Maj. Gen. Igor Konashenkov stated.